A 4 hour excursion along the upper stretches of the River Cam will give nature-lovers the chance to experience one of Cambridge's most varied habitats from the unique vantage point of a chauffeured punt. 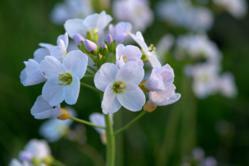 Cuckoo Flower - (c) Brian Eversham, The Wildlife Trust. This 4 hour excursion will provide a fascinating and comprehensive introduction to the most ecologically diverse stretch of the River Cam. After the success of last summer’s run of punting bat safaris, Scudamore's Punting Company have once again joined forces with The Wildlife Trust to deliver another fantastic Cambridge wildlife experience. This year, in addition to continuing to offer the bat safaris, a more general wildlife tour will be trialled along the Upper River towards Grantchester. This 4 hour excursion will provide a fascinating and comprehensive introduction to the most ecologically diverse stretch of the River Cam. The format of the new wildlife tour will be much the same as for the bat safaris, with each punt having their own expert aboard to deliver the highest possible standard of commentary. To this end, Scudamore's have recruited a high calibre, all-star Wildlife Trust cast of guides to lead the tours. These include Brian Eversham (Chief Executive of the Trust), Chris Gerrard (Director of Living Landscapes), Martin Baker (Conservation Manager for Cambridgeshire), Guy Belcher (Nature Conservation Officer for Cambridge City Council) and Iain Webb (Cambridge City Greenways Project Officer). During the course of the tour, the expert guide will introduce customers to the general habitat of the river and analyse its overall importance in the context of the landscape as a whole. They will be picking out species of particular interest along the way, as well as responding to any other ad hoc sightings that might take place during the course of the tour. “Generally, there will be up to a dozen species of dragonflies and damselflies, as well as a good array of birds on show during the tours. I have regularly seen over 40 bird species along this stretch of river including kingfishers, grey herons, green and great spotted woodpeckers, common terns, up to six species of warbler, reed buntings and skylarks. This new tour will be running across just four dates during the summer - 13th May, 10th June, 8th July and 12th August. Tours will depart from Scudamore’s Mill Lane Boatyard at 10:00, returning at around 14:00. The tours will be intimate affairs, with numbers limited to 22 places on each occasion. Adults £25.00, concessions £23.50 & under-12s £12.50 per person.